This book is a black and white copy of A Record of Shelford Parva, written by Fanny Wale in around 1917. However this version of the book also includes handwritten notes by Fanny Wale herself as well as some of her drawings not used in her original book. References in the book would suggest it was copied around 1930. The numbers used by Fanny Wale in her notes usually refer to the numbering she included (inconsistently) at the bottom of the pages of her book. Photos of all the notes and additions in the updated book can be found here. These are some of the most significant notes and pictures included in the book. Where possible, an original copy of the note has been included. There was once a windmill on the hill. The sails came off….And the windmills for corn grinding are now disappearing in 1927. The Maltern Close house and brewery belonged to Suard Lofts, his wife and new born baby Ben were saved only just in time when the house was burned to the ground – therefore the child was christened with the names of the three men who are mentioned in the old Testament – Shadrach, Meshack and Abednego. Charles Gee junior was a house builder, his wife was the post mistress for many years. 3. Henry Gee butcher in Great Shelford was father of Arthur who was Bursar at Downing College Cambridge. He married a Miss Maitland and they had (?) sons and daughters. Edward was Commodore of the first great airship which fell into the River Severn (actually the River Humber) – he and his brother Henry were burned to death. The Carters lived in Lime Cottage, and their son Albert married Elisa Agnes Watts and lived in High Street, near to Col Wood to whom he was chauffeur and valet. He was a very clever young man and during the great war with Germany he was employed at Cambridge railway station to help lift the wounded soldiers out of the trains into the motor cars which conveyed them to the Great Eastern Hospital at the back of the colleges where there were numbers of trained nurses waiting for them in a great number of iron and asbestos huts in a grass field. Anyone having a private motor car lent it for this work. It was fortunate that every young woman had taken Lord Robert’s warning and learned nursing and many other useful employments which had always been considered only fit for men. And were henceforth allowed to have votes. J.F.Eaden of Shelford Hall had a chauffeur in 1915 named Pitaluja who lived at Ingleside with his brother in law and family for a short time. They came from the Falkland Islands. In 1906 Miss Gall lived in Benoni for a short time, she was not related to the Galls of Little Shelford, she took a good degree in Mathematics at Newnham College, Cambridge and was sent by Government to give instruction in music etc to Boer children in segregation camps during the African War and after leaving Shelford she went to teach in Johannesburg where her sister was living. In 1926 the horse chestnut tree where Macaulay used to sit to study his lessons is still standing in the plantation at the lawn of the modern house built in 1852. Thomas Babington Macaulay (1800 -1859) was a British historian and Whig politician. He served as both Paymaster General and Secretary at War. James Thomason was Lieut Governor of the N.W.Provinces in India from 1843 to 1853. He was born at Little Shelford 3rd of May 1804. His father Thomas Thomason had been a fellow of Magdalen and Tutor of Queen’s College at Cambridge, had taken Holy orders and become the friend of Chas Simpson. On his marriage in 1799 he gave up his tutorship and settled in Little Shelford as Simpson’s Curate, inviting Simpson to stay with him in summer time for change and quiet after his work in Cambridge. 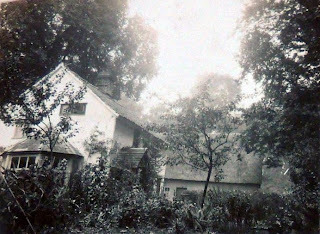 The Studio Cottage was once called Shelford school and was subsequently used as a painting, drawing and pencilling studio until the beginning of the Great War when Miss F.L.W (Fanny Wale) let the cottage to some homeless friends. 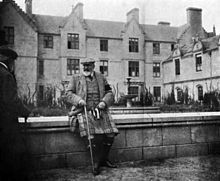 Sir Michael foster lived and died at Nine Wells House on the Gog Magog Hills, his son Michael is doctor and his daughter married a clergyman at Cambridge. The Mr Michael Foster who lived at Little Shelford made a beautiful garden round Westfield House was (the) uncle of Sir Michael. Doctor Gaskell of Cambridge and his wife lived in a charming house which they had built on the Gog Magog hill in Shelford Magna. He turned the surrounding rough fields and chalk pit into a very beautiful garden, he also had a deep well bored and a windmill over it to draw up the water to supply the house. He and his wife passed away in (not completed) leaving 2 daughters and one son named John who is a doctor who married Margaret, the youngest daughter of John Frederick Eaden who hired Little Shelford Hall from Col R.G. Wale (whose niece he had married) and she had two houses in Little Shelford belonging to her parents Dr and Mrs Willis- King’s Farm (page 25) and Ivy Cottage (page 66). (See page 64). Isabella Willis was stepmother to Mrs Margaret Gaskell and Grace Eaden (now Lucknow). J.F.Eaden’s first wife was their mother Margaret Close, sister to the Cambridge boating coaches. Henry Eaden married Annie Close. They have one son who married and 2 daughters and went to live in America. In 1926, the Rector of the Shelford Magna is the Rev Jeeves and the school master of the Church school for girls and boys of the parishes is Mr Smith who is also the organist. The print on page number 5 from the gentleman’s Magazine for March 1799 shows the damage done to the tower of St Mary’s Church by a thunderstorm about the year 1797. The damage was caused by a storm about 1797. Subsequently the shortened tower was repaired with the old material and one or two bays were removed and the tower put further east which considerably injured the proportions of the Church. Over the statuette of the Virgin and Child, there is a Priest’s chamber which was approached by a staircase in a small turret which is now gone. At the East end of the north aisle where the organ once stood is a beautiful little side chapel arranged by Mr Macaulay (who lived a short time in Great Shelford) in memory of his son who was killed in a frontier raid at the N.W. of India; over the attic is an artistic picture of the centurian at the foot of the crop with the words “Truly this was the son of God”. The Rev. Nettleship was the next Vicar of Great Shelford after the Rev. H.J. Orpen and during his time a vestry with an organ chamber over it was erected on the south side of the Chancel. More details about the Church were given to me by Rev Thomas Orpen. F.L.Wale. In 1926 the Platt Higins family are living at Hove having sold Westfields to some people named Thoday who did not stay there long. Brian Platt Higgings studied engineering at the Daimler munition works in Coventry during the Great War. Armistice was proclaimed on the 11th day of the 11th month of the 11th year. Cottages and strips of land behind them were sold at various times to Fordham the tenant farmer of Shelford Hall estate. John Godfrey brought up a large family in one of these cottages. In 1926 one of his sons lives in a cottage on the road to Hauxton belonging to the Austins, his name is Jess, he has wife and children. Godfrey wheelwright Re page 43. He was succeeded by Aleck Larkin who came back wounded from France but he learned to drive motors and is married. After several operations to his leg he is able to do garden and allotment work in 1926. 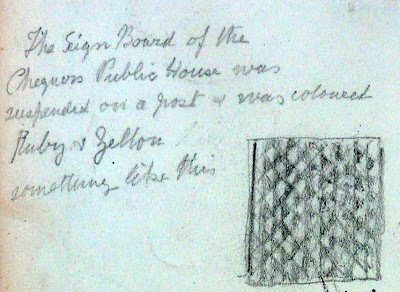 Compiled by the Rev Henry Wale from the notebook of Thomas Wale. He was Gregory’s oldest son and inherited the Little Shelford estate etc. He lived in the old Tudor house at the junction of the three roads near All Saints Church, where stood a stone cross upon a triangle of grass. The cross gradually disappeared but the base of it is in the Churchyard. In 1926 the old house is called the Lodge because it stands at the entrance gate to the modern house built by Col. R.G. Wale in 1851. The foundations of the obelisk having become unsafe in 1909, a new foundation of concrete was made by Marshall the local builder with subscriptions from Gregory wale’s numerous descendents. Arthur Dare lived in Wisby’s house. He passed away in 1916 (?). The Tredgits subsequently lived there. The William Dare’s son Edward married Emily Brasier duaghter of Martha Brasier who lived with her brother Jim who was humpbacked. The W Dares went to gold mine sin Africa with one son named Teddy. A Miss Jennings and her sister Mrs Cracklin lived in the thatched cottage near the Pound – they had some curious little mementoes given to them by the celebrated dwarf called gen Tom Thumb. Mrs Cracklin tried to hang herself on a beam – probably later on she succeeded in committing suicide for an old woman did drown herself in the well of the cottage garden, so it had to be filled up and there is no well there now, the people draw their water from the well near Lime Cottage. An old man and his wife played at being Jack and Jill in the same thatched cottage, they tried to carry a pail of water up the steep winding stairs and fell down one on top of the other but neither of them were seriously hurt. Institute built here in 1925. Cintra Lodge in 1922 was inhabited by ? Harris with wife and ? children. Mr and Mrs Bagnall lived in Cintra Lodge from 1805 to 1892 when they moved into the house which they built on the Newton Road. It was designed by their friend Mr Pilkington. Cintra Lodge was built by Mrs Dawson’s sister Mrs Dyer built the house for her – see page 34. On April 5 1908 Louise Wale of Sunninghill (see page 35) sent to me F.L.Wale the following memorandum copied from her father’s papers. He was the Rev Malcom Wale. 27th March 1845 – sold mausoleum. Paid for brick graves about £20. There are seven within the railing. To the west are Thomas wale aged 95 – 1796 – Rodolphina his Russian wife 1776 aged 52 Their son Gregory Wale 1794 and two infants. There is an ancient shield shaped coat of arms of the Wale ancestors in Saffron Walden Church at the West End and there is also a memorial slab on the floor. Isabella died in the West Indies. She was the 2nd wife of Sir Charles Wale and was the daughter of a clergyman named Johnson who was living in Barbados at the same time.